If you are denouncing the “dastardly act of terror” at Pulwama but haven’t uttered a peep against pellet guns or the other many barbarities of the occupation, you may be what is called ‘a Progressive except on Kashmir’ (PeK). Now Indian nationalists are claiming Pulwama was an inside job. By whom they do not say. Resorting to conspiracies allows them to ignore that the teenage suicide bomber was deeply resentful after he had been publicly humiliated by Indian forces. Such is the character of the occupation at its most benign. But mostly conspiracy-mongering allows nationalists to go off half-cocked & ignore the presence of nearly a million Indian troops in Kashmir. The only response to Pulwama should be to demand the immediate, unconditional withdrawal of all Indian troops. Many are calling for dialogue between the Indian government & Kashmiris. What’s to talk about as long as there are Indian troops in Kashmir? How can there be dialogue with 700,000 guns pointing at Kashmiri civilians? The first demand should be for the withdrawal of those troops & only then is dialogue possible. The Indian government & its braying chorus of nationalists are using the Pulwama incident to incite an uproar & make propaganda inroads against the Kashmiri freedom struggle. Because of repression, Kashmiris cannot always speak freely on social media lest their accounts be shut down. Supporting their political power against occupation requires us to step into the breach & respond to all the nationalist vituperations by demanding the withdrawal of Indian troops. This is not a time for compromise or conciliation but for steadfast support to one of the most important anti-colonial struggles of our times. Correct me if I’m wrong, but isn’t the furor over Pulwama, an action by a handful of young, misguided militants, several thousands times more energetic & vituperative than protest against the use of pellet guns in Kashmir or the constant violence faced by Kashmiris, including small children, at the hand of 700,000 Indian troops? No concessions can be made to such hypocrisy. If the Indian government did not deploy 700,000 troops in Kashmir, no soldiers would get killed & tens of thousands of Kashmiris would not be executed, forcibly disappeared, tortured, jailed, raped, disabled, disfigured, terrorized. The only appropriate response to the Pulwama incident is to demand the immediate, unconditional withdrawal of all Indian troops. 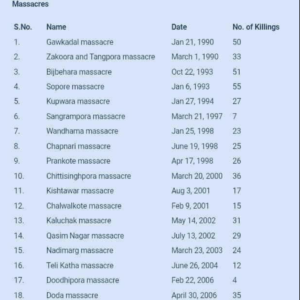 All deaths because of occupation are solely the responsibility of the Indian government. An Indian socialist & Assadist once ranted that my support for the Syrian Arab Spring was because as ‘a white person from the Christian tradition’ I was incapable of thought. Not the kind of argument that will bring me to my knees since it’s so tawdry. Now he’s carrying on about ‘martyred Jawan’ & posting articles about the rise of terrorism in Kashmir. Politically, it’s of a piece with his belief that the Syrian Arab Spring is all terrorists. He’s another socialist who bought right into the so-called war on terror which is the ideological cover for war, occupation, & genocide. What’s next for our man? Support for Modi like his support for Assad? The “martyrdom of Jawan” in Kashmir? Seriously? Scratch an Assadist, find a nationalist. What’s next for those special forces troops? Canonization?